Paros is truly an island with something for everyone – perfect for families with small children, seasoned travellers, and honeymooners alike. It sits at the center of the Cycladic islands in the Aegean sea. The Cyclades are some of the most popular Greek islands, due in large part to their beautiful sandy beaches and sparkling azure waters. Paros shares this blessing – the island's beaches are magnificent, some bustling with bathers others quiet and practically untouched. Paros is world renowned for its kiteboarding and windsurfing. 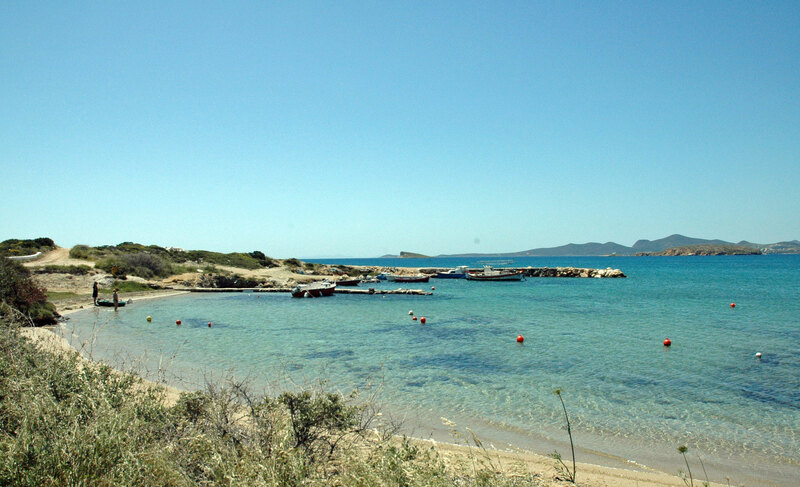 Spectacular Golden Beach, Kolymbithres, and Santa Maria are very well known Parian beaches, plus each corner of Paros offers its own coastal treasures. Guests at the Olive House are likely to visit Voutakos, Pygadaki and Alyki beaches – all within a 10-minute drive of the house. Beyond the obvious delights of the sea and sun, Paros is an island of ancient churches and whitewashed stone houses.. Visitors will discover rich historical treasures, a diversity of art galleries, and excellent locally produced food and wine. The island's main towns are Parikia and Naoussa, both of which offer excellent shops and restaurants and vibrant nightlife during the summer season. Alyki is near Olive House, with a playground, shops, and delicious tavernas. It's also fun to explore the tiny hamlet of Marpissa, and the beautiful ancient village of Lefkes, inland, at the island's highest elevation. Byzantine walking paths criscross the hills. In Paros, you can both indulge in a glorious, relaxing holiday and also immerse yourself in art and culture. 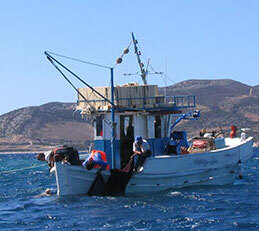 For example, the Aegean Center for the Fine Arts offers workshops and cultural programmes. Check Paros Life for info on what's on during your stay. For those eager to venture further afield, ferries to neighboring islands operate regularly throughout the high season. The islands of Antiparos, Naxos, Mykonos (with Delos, one of Greece's most important archeaological sites), and Tinos are only a short boat ride away and can easily be seen in a day trip. 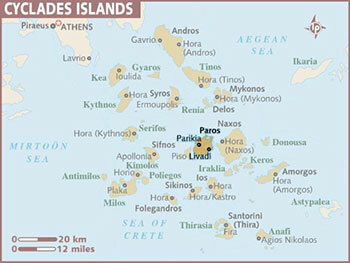 Paros is roughly 70km long. The main road circles the island, covering approximately 120km of coastline. 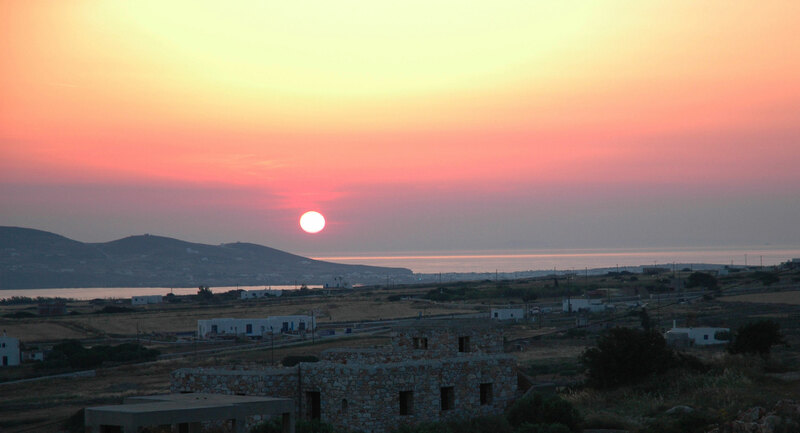 During the off-season, Paros is home to about 10,000. During the high season (June through September), temperatures range from low- to mid-20s C (70s–80s F). Expect warm days with bright sun and frequent island breezes, thanks to the ever-present Meltemi, a strong north-westerly wind felt throughout the Cyclades. In winter, the island can be rainy and cool, but Olive House is well heated.